Wheat, Weizen and Weisse beer recipes have become very popular craft and homebrew beer styles here in the United States over the last 20 years. Today, we’ll look at the history of wheat beer, how to brew a wheat beer and a sampling of wheat beer recipes including both Bavarian Weissebier and Berliner Weisse. Since wheat is a staple grain, it should be no surprise that wheat has been used for several thousand years to brew beer. There is historical evidence to suggest that wheat has been used in brewing much longer than barley, and in fact barley beer became popular only in the last few hundred years (Ref: Daniels). Daniels mentions that in certain historical periods the use of wheat for brewing was actually banned over concerns that too much wheat was being diverted from the food supply to making beer. Modern wheat beer is centered around two German styles: the more popular Bavarian Weissebier from southern Germany and Berliner Weisse from Berlin. A third wheat style that is growing in popularity today is Belgian Wit or white beer, but I will dedicate a separate article to that style in the future. American wheat beer is similar in many ways to Bavarian Weisse, but without the characteristic Bavarian wheat yeast. German brewing literature contains many references to wheat beer going back at least to the 1400’s in areas spanning from Denmark to Hamburg to Vienna. Bavarian Weisse (white beer) has a much more direct lineage. According to Daniels, the first wheat beers were brewed under noble license of the Degenberger clan in the 15th century. In that same period the first wheat beer brewery was built in Munich, and the brewing of Weissebier was strictly controlled and licensed by various dukes throughout the 16th-18th centuries. In 1872, royal control was finally loosened to move weisse brewing rights into the public domain. Wheat lacks key nutrients and enzymes needed for proper conversion of sugars during mashing, so malted wheat is always combined with barley malt to provide enzymes for mashing and fermentation, often at a mix of between 40 and 60% wheat. Bavarian wheat beer derives the distinct clove and banana flavor from the use of distinct strains of yeast. Similarly Berliner Weisse uses a distinct yeast strain along with lactic acid bacteria to produce a tart flavor. American wheat beer has a more neutral flavor from the use of common ale yeast. German wheat beers were traditionally brewed using decoction methods, though a home brewer can achieve excellent results with a single step infusion mash. Ray Daniels notes that fermentation temperatures are very important in wheat beer due to the sensitivity of the yeasts involved. He recommends a fermentation temperature of 64-66 F (around 18C). Weisse has a target original gravity of 1.040 to 1.056, color of 2 to 9 SRM, and bitterness between 10 and 20 IBUs. It has very low bitterness, low to medium body and high esters as well as banana and clove flavor derived from the yeast. Bavarian Weisse or Weizen is almost always made from only two base malts: wheat malt and pilsner or pale malt. The percentage of wheat malt varies from as little as 20% to as much as 60%, but 40-50% is a good average number. Note that wheat malt can’t be steeped and must be mashed, so if you are an extract brewer be sure to use wheat or weizen extract as the base malt. Decoction or a single infusion mash is acceptable with a recommended conversion temperature of around 152F. The hop schedule for Weisse is minimal – typically a single noble hop addition at the beginning of the boil. Hallertau hops are most commonly used, though Saaz, Tettnanger and Hersbrucker are also popular. A low hop rate giving 15-17 IBUs is typical. The use of distinctive Bavarian wheat yeast is critical to the style , as so much of the Bavarian flavor profile is derived from the yeast itself. Bavarian Weisse is highly carbonated, at 2.4-3.0 volumes. Hefeweizen (with yeast) is served relatively young with the yeast still in suspension giving a cloudy character. Krystal (clear) is filtered commercially to give a crystal clear finish. American wheat beer shares much in common with Bavarian Weisse, using basically the same grain bill, low hop rate, and pale color. The main difference is that American wheat beer is typically fermented with American ale yeast, giving a neutral and clean finish, but lacking the banana and clove flavor that Bavarian wheat yeast provides. American wheat beer is often served at moderate carbonation and occasionally uses American hops, though hop flavoring is not significant for the style. Berliner Weisse has an original gravity between 1.026 and 1.036, a very low hop rate of 3-8 IBUs, a pale color between 2-4 SRM and is served highly carbonated (2.5-3.0 volumes). The flavor profile is sour from the use of lactic bacteria or lactic acid. They have a light body, and dry tart finish. Berliner Weisse is typically brewed from equal parts of wheat and pilsner or pale malt base, though in some cases up to 70% wheat may be used. 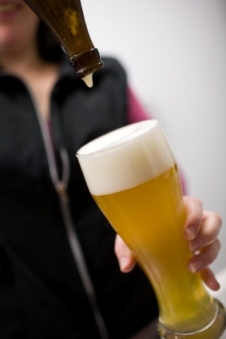 Extract brewers should use a base of weizen or wheat extract. Low hop rates are used in a single hop addition, and again noble hops such as Hallertau, Saaz or Tettnanger are most popular. Berliner yeast is most often used with the addition of either lactic acid bacteria after primary fermentation. As an alternative, some home brewers spike their beer with food grade lactic acid (Daniel’s recommends 90 ml for 7 gallons) to give the sour, lactic finish required. I hope today’s article on classic wheat beers will help you to formulate your next Weisse or Weizen recipe. Thank you for joining us on the BeerSmith Home Brewing Blog. For weekly delivery, consider subscribing via email or RSS. If you enjoyed the article, give us a “thumbs up” on Stumbleupon or drop a free vote for this story on BrewPoll using the BrewPoll vote count button below. Can you get acceptable results in Weizen using a single infusion with wheat malt or is decoction mashing necessary when using wheat malt. Its true if you use unmalted wheat. However Weizen is usually made with malted wheat, which does not have this problem. Only Wit and a few other beers use large quantities of unmalted wheat. You don’t know what you’re talking about. Malted wheat contains more enzymes and distatic power than any type of malted barley, the reason is because 100% wheat grists often result in stuck mashes. Brad, I’m curious as to why you say wheat malt can’t be steeped. I brewed a blueberry wheat extract kit from my LHBS yesterday. It came with a half pound of wheat to steep; which I presume was included to give the beer some freshness and counteract stale or soapy flavors from an all-extract grist.